The commemorative Czechoslovakia stamps of 1935 to 1937, honored famous Czechoslovakians, the fight for independence from the Austro-Hungarian Empire, and the passing of the country's founder and first president. This period ended with an impressive souvenir sheet for a philatelic exhibition in Bratislava. 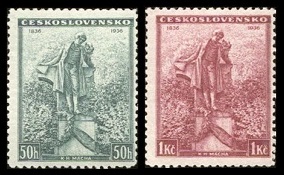 The four commemorative Czechoslovakia stamps shown above were issued on March 1, 1935 to celebrate the 85th Anniversary of the Birth of President Thomas Masaryk. The four stamps (Sc. #202-205) feature contemporary portraits of Thomas Masaryk. The three commemorative Czechoslovakia stamps shown above were issued on June 22, 1935 to celebrate the Anniversary of the Arrival of Saints Cyril and Methodius in Moravia. The three common stamp designs (Sc. #209-211) feature Cyril and Methodius holding a Bible. St. Cyril (826-869) and St. Methodius (815-885), brothers from Thessalonica, were Byzantine missionaries that brought Christianity to the Slavs of Great Moravia during the 9th Century. The two Czechoslovakia stamps shown above were issued on April 30, 1936 to commemorate the 100th Anniversary of the Death of Hynek Macha. The two common stamp designs (Sc. #213-214) feature the statue of Hynek Macha, located on Petrin Hill in Prague. The statue represents an allegory of "immortal youth". Karel Hynek Macha (1810-1836) was a Czech romantic poet. During his lifetime, his work was not popular, and it wasn't until many years after his death that his poetic genius was appreciated. He unexpectedly died of pneumonia in 1836, being only 25 years old, and he was buried in a pauper's grave. In 1939, his remains were exhumed, and he was given a formal state burial at Vysehred Cemetery, on the grounds of Vysehred Castle in Prague. The cemetery is the resting place of many famous Czechoslovakian composers, writers, artists, scientists, and government leaders. 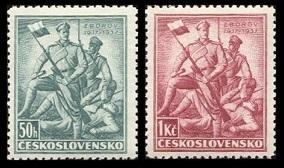 The two commemorative stamps shown above were issued on June 15, 1937 to honor the soldiers of the Czechoslovakian Legion and to celebrate the 20th Anniversary of the Battle of Zborov. The two common stamp designs (Sc. #228-229) feature a representation of the soldiers of the Czechoslovakian Legion. The Battle of Zoborov, in July 1917, was part of the Kerensky Offensive against the Austro-Hungarians and the Germans in Galicia. It was the last Russian offensive action of World War I. The Battle of Zborov was a victory, though the Kerensky Offensive was later a loss for the Entente Powers. The two commemorative stamps shown above were issued on July 1, 1937 to celebrate the 16th Anniversary of the Founding of the "Little Entente". The two common stamp designs (Sc. #230-231) feature the Prague Cathedral. The Little Entente was an alliance formed in 1920 and 1921 by Czechoslovakia, Romania, and Yugoslavia. Its purpose was for defense against Hungarian invasion and for the prevention of the restoration of the Hapsburg (Austro-Hungarian) monarchy. 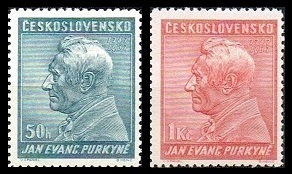 The two commemorative Czechoslovakia stamps shown above were issued on September 2, 1937 to celebrate the 150th Anniversary of the Birth of Jan Purkyne. The two common stamp designs (Sc. #232-233) feature the profile of Jan Purkyne. Jan Evangelista Purkyne (1787-1869) was a Bohemian anatomist and physiologist, one of the best known scientists of his time. He coined the term "protoplasm" for the fluid substance in a cell. 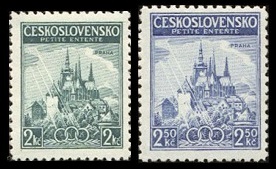 The three contemporary Czechoslovakia definitive stamps shown above (Sc. 236-238) were overprinted "B.I.T.1937" on October 6, 1937 to celebrate the International Labor Organization. The International Labor Organization held its conference in Geneva, Switzerland, in June 1937. The souvenir sheet shown above (Sc. #239) was issued on October 24, 1937 for the Bratislava Philatelic Exhibition. 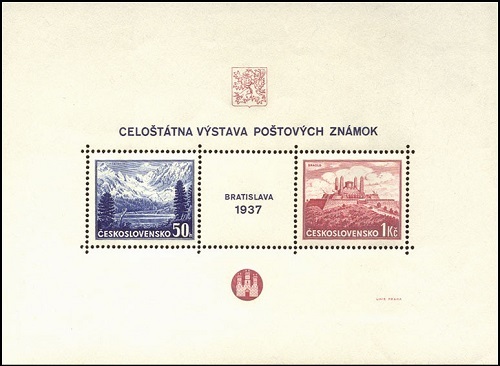 The 50 H. denomination stamp features a view of Poprad Lake in the Tatra Mountains. The 1 K. denomination stamp features the tomb of General Milan Stefanik in Brezovza pod Bradlom, Western Slovakia. The two commemorative Czechoslovakia stamps shown above were issued on May 4, 1935 to celebrate the 20th Anniversary of the Second Battle of Artois, near Arras, France. The two common stamp designs (Sc. #206-207) show the La Targette Czechoslovakian Memorial, created by Jaroslav Hruska and unveiled on May 31, 1925. The memorial pays tribute to ALL the Czech and Slovak soldiers that were killed in World War I. The Second Battle of Artois took place near Arras, France on May 9, 1915. The Czechoslovakian soldiers that fought in the battle were volunteers who lived in France and abroad. Two hundred fifty men enlisted in August 1914, into what was to be called the Nazdar Company, part of the first regiment of the French Foreign Legion. The Nazdar Company was involved in an assault on May 9, 1915. Fifty men were killed and 150 were wounded. The survivors of the assault remained in the Foreign Legion, until they joined their own national army, when Czechoslovakia became independent in 1918. 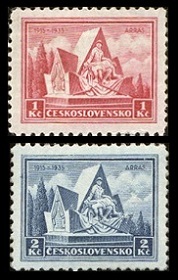 The two Czechoslovakia stamps shown above (Sc. 234-235), were issued in September 1937, to mourn the Death of former President Thomas Masaryk on September 14, 1937. The 50 H. denomination is identical to the definitive stamp of 1930, except that it is printed in black. The 2 K. denomination is identical to the 85th Birthday commemorative stamps of 1935, except that it is printed in black, and that it is inscribed with the date "14.IX / 1937". Masaryk died less than two years after leaving office, at the age of 87. Dying when he did, he was spared witnessing the Munich Agreement and the Nazi occupation of his country.